There was a time when Nerf was more than just a weapons company. Yeah, Nerf still makes footballs and other tossable toys but for the most part they just make guns. Lots of guns. Don’t get me wrong, I like their guns. I have a small arsenal of Nerf guns myself. They’re fun. I’m not asking Nerf to stop making guns but an ancient discovery in my parents basement made me think back to a time before the Nerf Army invaded. 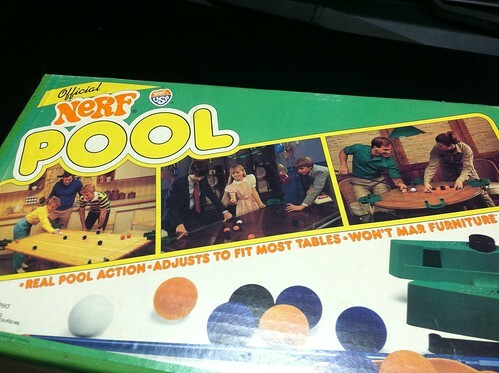 Much along the lines of Nerf Ping Pong, Nerf Pool allowed you to turn any table into a pool table. The set only had four pockets but they could attach to any table using their vice-like design. Once you had your pockets where you wanted them, you would stretch a long strip of elastic between them creating your sidewalls. Again, pretty genius. The pool balls were light plastic covered in a velvet-like fabric. There four blue balls and four orange balls, an 8-ball, plus the cue ball. That was pretty much it and that’s all it needed to be. The fact that you could put the pockets in any configuration you wanted would often lend itself to “abnormal” table setups but that was part of the fun too. You could really create your own pool game right on your kitchen table. And while the memories of Nerf Pool are great, I don’t think they’re half as great as the Nerf Pool box. Yes, somehow the Nerf Pool box survived childhood and storage. Sure, it is a little worse for wear but it’s still holding together and still showing off the classic marketing Nerf used to pride themselves on. First, the Nerf logo was 70s awesome…and “official”. I admit, the logo back then is something to be desired today but as of the early 1980s they hadn’t yet prided themselves on being an arms dealer. Second, the box was designed to sell. Just look at those “action” photos. It’s pretty clear that you can use Nerf Pool in your kitchen, your formal dining room or in the bar. Not to mention it’s clearly great for mom and the kids, birthday parties or your first date. Nerf Pool had it all: safety, convenience and fun. As I’ve mentioned twice already, I see this as just pure genius. Nerf has always meant “safe” toys and something like Nerf Pool and Nerf Ping Pong allowed kids to play those games without needing to beg their parents for the real thing. 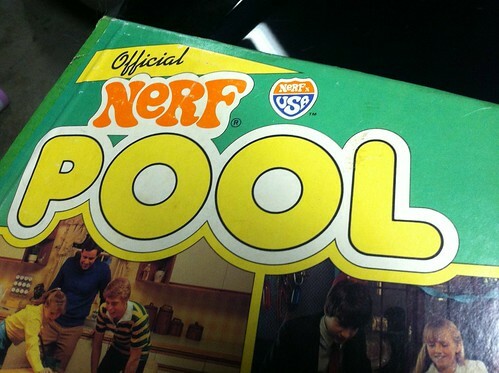 Growing up I knew Nerf Pool wasn’t “real” pool but that didn’t stop me from wanting to play all the time. I probably thought it would help me play real pool later in life (it didn’t). Nerf probably isn’t too interested in rekindling this market of sports toys. They’re making boatloads of money selling dart guns. Heck, when you go to the Nerf web site you’re hard pressed to find a simple football. Even back then I doubt Nerf Pool was flying off the shelves, I get it. But as current parental climate continues to be concerned with the toys kids play with – particularly guns – I’d like to think Nerf could bring these indoor toys back to the market and that people might actually buy them. If I was Nerf, I’d bring back a “Nerf Classic” line of toys that caters to the retro-minded folks like myself. Nostalgia is very powerful and I’d happily drop some cash to buy Nerf Ping Pong to play with my kid. I’m one of the few people who’d like to buy one of these if Nerf were still making them. A French sporting company, Geologic, is manufacturing a remake of Nerf Pool. It’s called ‘HomePool’ and it’s available for sale. I honestly can’t remember how I heard about it, but the idea’s the same: attach the pockets on the corners of the table, apply borders between two pockets, and play.